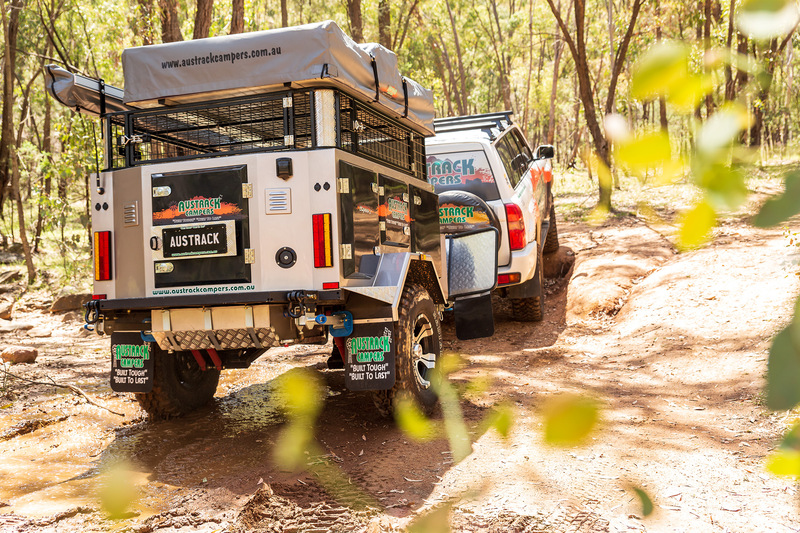 The Austrack Simpson X is a camper to suit adventurous types. Equipped to take on the most rugged tracks, light enough to suit a range of vehicles, and affordable enough to suit a range of budgets, the Simpson X wowed judges with its versatility, commitment to high standards and, unsurprisingly, its X-factor. Austrack’s Simpson X makes a great little base camp for those with a sense of adventure. I really like the simplicity of this compact camper, which features a spacious rooftop tent for your sleeping quarters, a stack of storage space in the camper box, a simple pull-out kitchen and fridge slide, a 270 degree wrap-around awning to cover your living and dining areas, and a separate ensuite tent. For a camper with these dimensions, the amount of storage is excellent; it includes a big front bin, pull-out drawers and a versatile storage cage at the top of the camper with a wide access door – perfect for storing and transporting your camp table, chairs, tarps or recovery gear. The Simpson X obviously doesn’t have the same comfort factor you’d find in a forward fold with an interior dinette, but it will suit people who are happy to keep it simple and really do their living outdoors. The kitchen has a two-burner cooktop and plumbed sink. Food preparation areas are limited to the cooktop cover or the top of the pull-out cutlery drawer. The 75L Evakool fridge/freezer (included in the package) sits at the camper’s rear, so you might find yourself doing a bit of back and forth at meal times, but still, it’s all pretty functional. 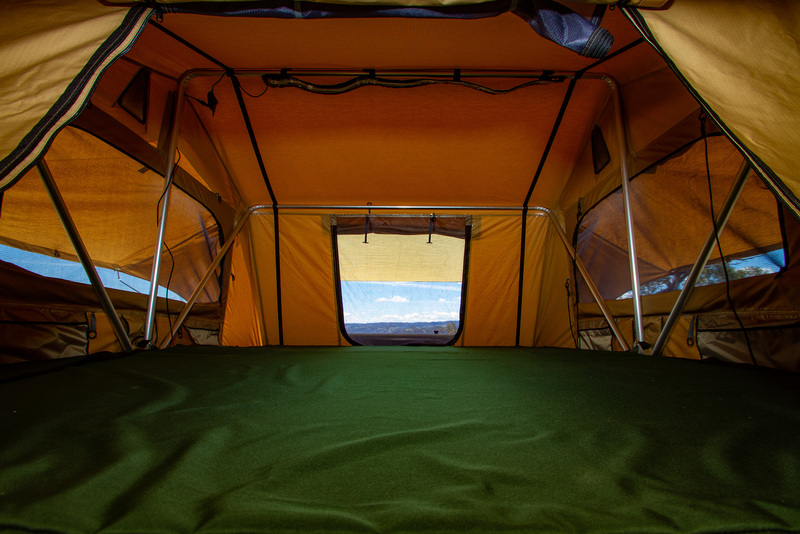 Up top, the 1.8x2.4m tent is roomy and has a comfortable foam mattress. The tent’s big, shaded windows afforded some pretty spectacular views of the countryside from our judging site at Mudgee, along with a pleasant breeze. It comes with a lower annexe and floor to extend the living space, and there’s some thoughtfully placed storage pockets, an LED strip light, and two straps to assist with your descent. Getting up and down the ladder from the tent won’t be easy for everyone and may not appeal to some. Personally, I would happily throw my gear into the Simpson X and leave a trail of dust behind me. I love expedition-type trailers, because they’re simple and lightweight, yet provide all the necessary items and features you need when wandering far from home. As with everything, some makes and models do it better than others. When it comes to the practical, not-so-glamorous side of this particular expedition-ready camper, you’ll find it offers all you need as far as electricity, gas and water are concerned. For cooking and hot water, the gas system starts off with one 9kg gas bottle, housed up the front and plumbed to the two-burner Smev cooktop in the kitchen. A quick connect gas connection for the Country Comfort hot water unit, that can supply the shower and the sink, is also included. Water storage consists of a 100L stainless steel tank, with an aluminium tank guard, located between the chassis rails under the camper body and rear of the axle; and all that weight is down low where it should be. A 12V pump plumbs the water direct to the kitchen, as well as to a tap on the drawbar, which is easily used to feed the hot water system. 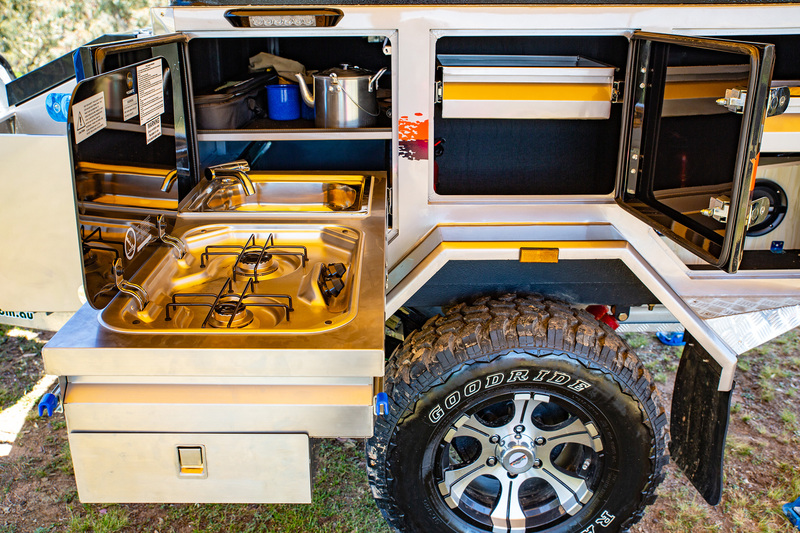 Electrical-wise, the camper comes with two 120Ah AGM batteries, and a host of 12V sockets and a couple of USB connections. There are LED lights in the tent area, LED strip lights under the awning and an LED light above the kitchen. A stereo system mounted in the large pantry area ensures you’ll have entertainment when away from the bright lights of your hometown. A 20 amp battery charger is supplied from the mains AC power, while a 160 watt solar panel will keep the batteries charged and everything shipshape when off the grid. The compartment housing the batteries, at the offside rear of the camper, also contains the electrical management system, electrical switchgear and main circuit breaker, along with a water gauge to let you know how the water supply is holding out. In sum, the Austrack Simpson X packs well above its weight in what you get for the dollars outlaid. 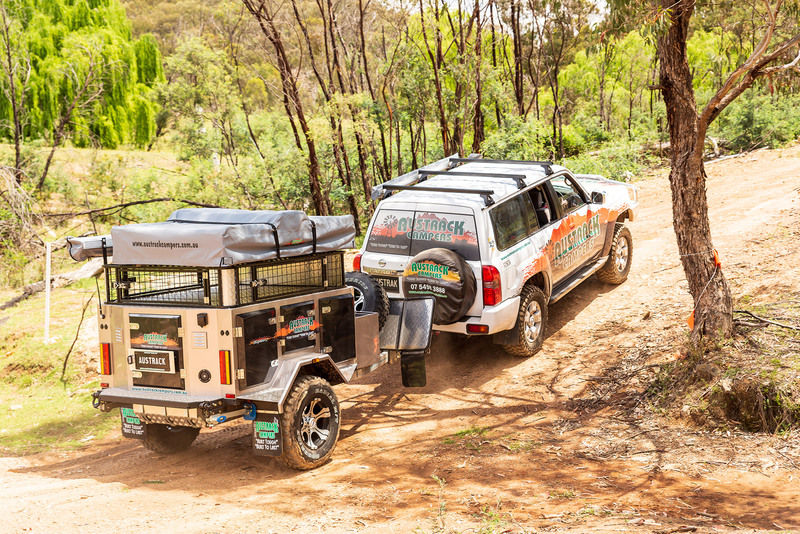 This well-priced, go-anywhere trailer would suit the more adventurous 4WDer and their family, whether they are heading for Cape York or the Canning. 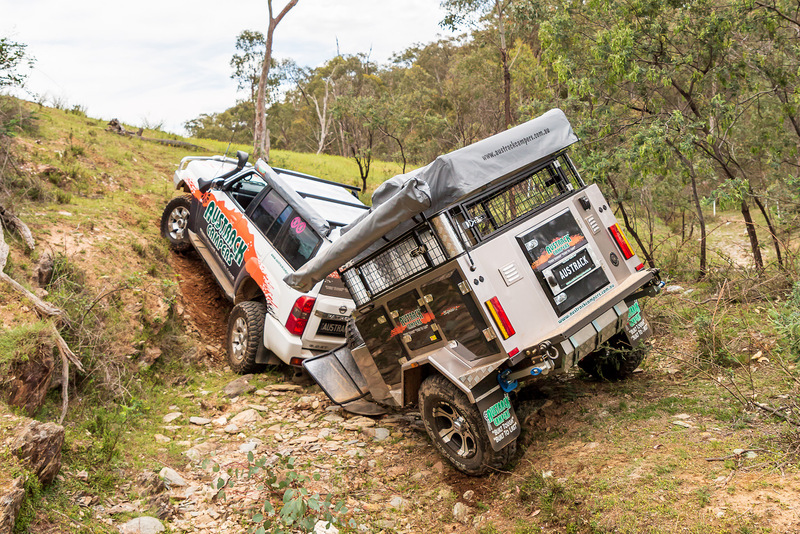 The Austrack Simpson X is one of those campers that drop automatically into the ‘adventure’ category, a category suited to those seeking the extremes of offroad capability. Prerequisites include great ground clearance, impressive entry and departure angles, minimal weight and size, and an array of ‘bushable’ features. The Simpson X shows just how much you can get for a surprisingly low price of $17,990. Typical of such campers, it houses its occupants in a roof-topper type tent, has a copious storage bay at the back, a kitchen along the passenger side, and a large radial awning. However, this Austrack offering adds to that with a handy, clever and roomy storage cage beneath the tent. At just 900kg Tare weight, with a 600kg load capacity and a featherweight 90kg ball loading, this camper makes for ideal towing around steep or awkward country. It was, in fact, the lightest camper we assessed. 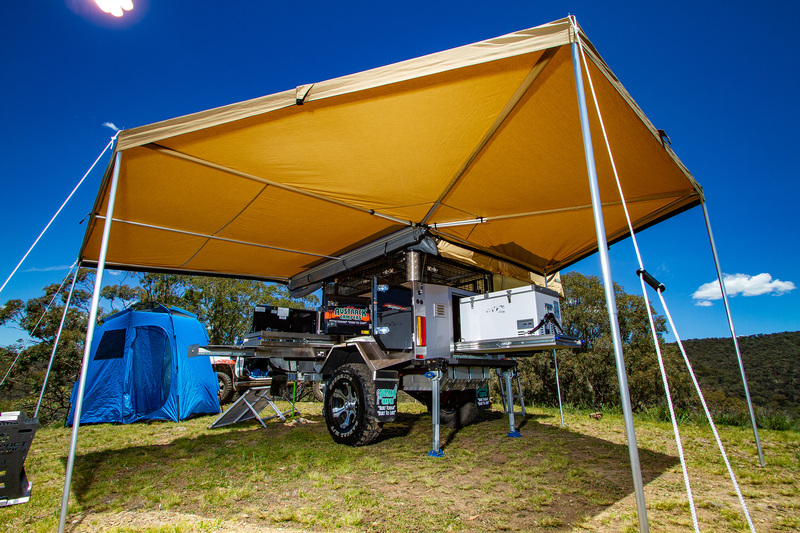 The Simpson X is built on a sturdy 150x50x4mm drawbar and chassis, all hot dip galvanised, and – like so many campers competing in 2019’s REDARC CTOTY – it’s coated in underbody deadener to further protect everything from stone damage. 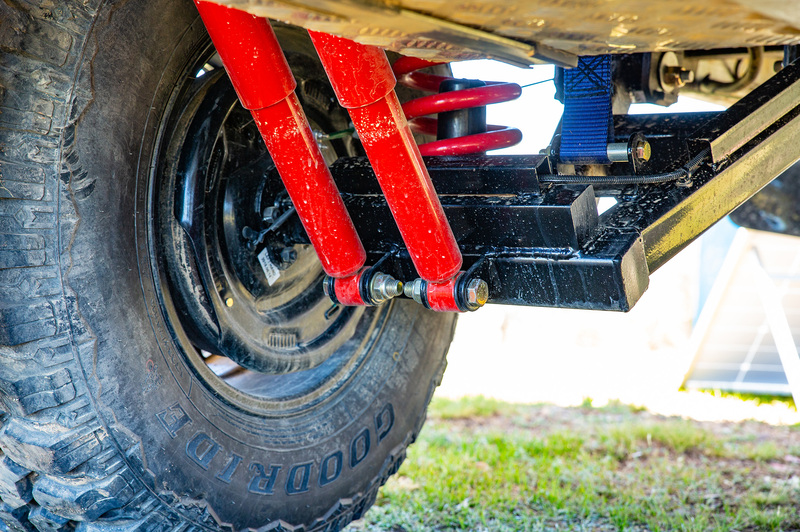 The suspension is the usual fully adjustable double shock trailing arm independent setup, with restraining straps included, rather than chains, in order to minimise noise. The brakes are 12in heavy-duty electric units – somewhat overkill on a camper of this size – with six-stud hubs and parallel bearings. The rims are high rated alloys with 265/75R16 mud terrain rubber. The coupling is a McHitch Uniglide 2T drop-on unit, with an Ark 500 jockey wheel. Both the alloy checkerplate stoneguard at the front and mud flaps beneath protect the bodywork. As we’ve become accustomed to seeing at CTOTY, the Simpson X retains Austrack’s high standards of finish and fit-out. Highly recommended. I just kept on repeating over and over again, the Austrack Simpson X – what a little ripper! This tough little nugget lifts the portable chuckwagon style of camper into a whole new realm, thanks to its individuality, ample comforts, load of features and exceptional value for money. 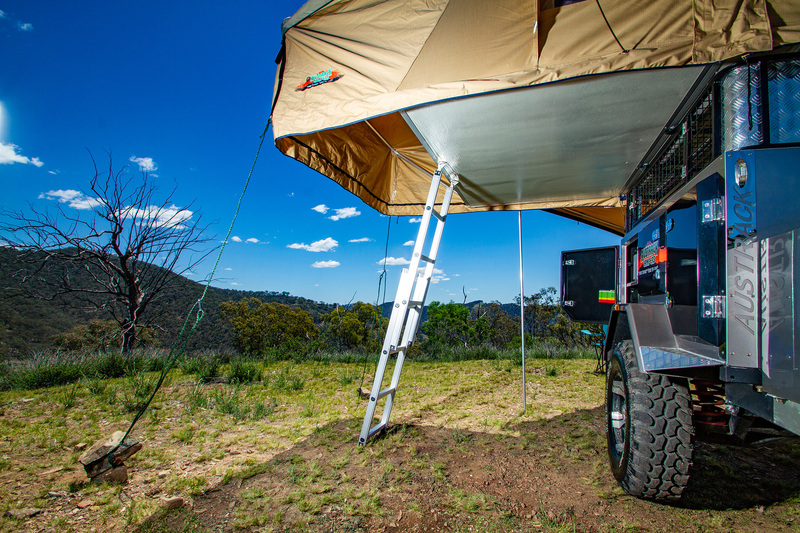 Its lightweight offroad credentials will get you into some beautiful and remote campsites, places where others fear to tread. Its compact, go-anywhere style will also appeal to those with smaller RVs and even commuter vehicles, as well as those with confined storage back at home. 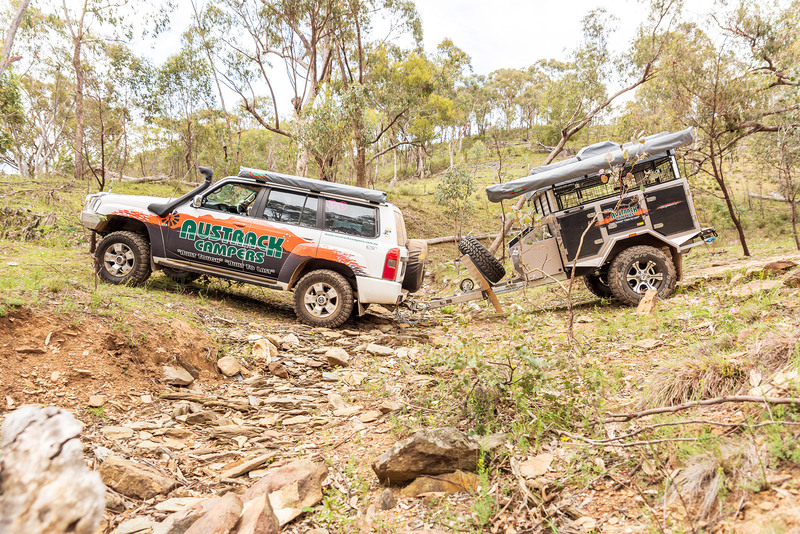 Austrack aren’t a manufacturer who stay still; for the sake of your outback travels, they continue to combine up-to-date engineering and construction with a well-selected assortment of features. That’s particularly true of the X-series Simpson, which sets its crosshairs on both off-grid capacity and liveability. 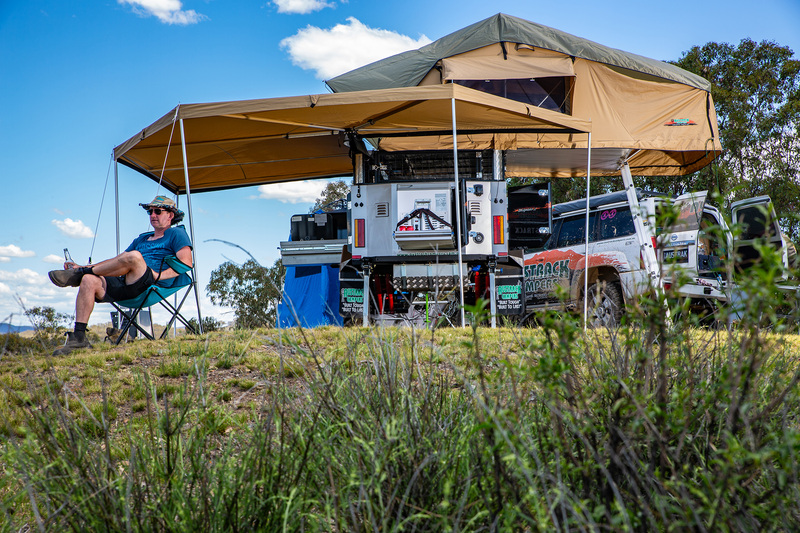 The 1.8 metre rooftop tent sleeping quarters assembles with the haste you’re going to want after a big day on the road. That said, not everyone’s into making their way upstairs, whereas others will prefer it. But I think it’s safe to say everyone will appreciate the shady haven on offer under the 270 degree bat-wing awning. Particularly given that, with the surprising amount of storage available in this compact unit, you can bring all the entertainment you need to keep yourself entertained under there for hours – and of course, to keep yourself entertained under the blazing Aussie sun. Overall, the Simpson X is what I call a ‘Queenslander’ style of camper. Its price, muscle and feature list are bound to secure it a big fan base, but it’s probably most suited to a younger couple or committed offroad specialists looking for a tough little base camp at the end of a long, hard track.